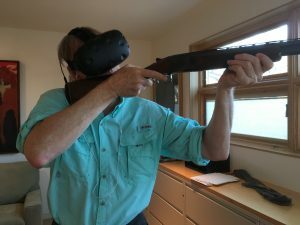 The Ergonomics of Using a Real Gun as a VR Gun Controller ? 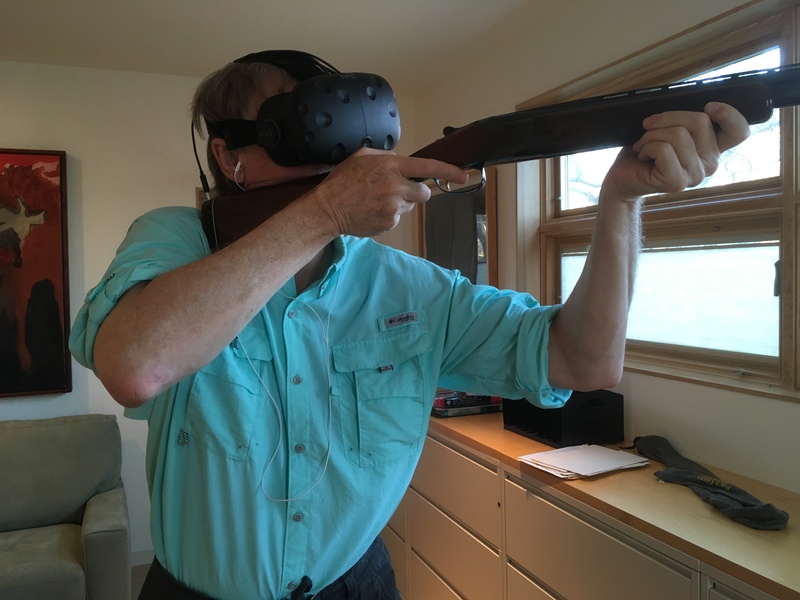 Can you recreate the ergonomics and sight picture of a real shotgun in VR ? More precisely, when your head is on the stock, do you see in VR what you see at the range and the field ? The short answer is yes – if you shoot “heads up” – as someone that I have known since birth demonstrates below with an old Browning with a low comb.. This is kind of important to know since we get the first prototype VR gun controllers next week. If you shoot head up – facing the target more or less “head on” – the FOV of the VR goggles is sufficient to give you good peripheral vision – about as much as you can use shooting clays. Head up – see it all ! If you shoot head turned down onto a low comb, you are apt to cut off some of your offhand peripheral vision since the VR goggles act like blinders at the edges. With head turned down on a low comb, the offhand side (away from trigger hand) may lose a bit of peripheral vision. So if you have a target coming in from 9 o’clock, your peripheral vision may not pick it up as quickly. That’s the way it is in the real world, the “blinder” effect of the goggles simply emphasizes the fact that you can compromise your peripheral vision based on how you hold your head to the comb. The next challenge we face is the rib – if you shoot a high one, we are going to have to add an adjustment in VR to allow the VR rib to be raised. Head turned down – see it small ?